Monday March 6th 1922 An unpleasant day. I read some and was down to Fannies. I wrote to Millie Byington. Letter from Lydia. Hattie down stairs. Tuesday March 7th 1922 I sewed a little in forenoon. Cora home all day and Hattie down stairs. I down to Fannies. Wrote Minnie Culbertson. Wednesday March 8th 1922 Rob & Cora were gone all day to Cedar Rapids. I was down to Fannies in forenoon. Hattie in afternoon. We had a quiet day. I had letters from Mrs Blackman, Belle Stinson & Lizzie D L. Thursday March 9th 1922 Cora went away before noon to their P E O luncheon. I got a little dinner for Hattie and myself. Rob came for Hattie and I at 1.30. She went to the meeting and I to Will Humphreys funeral. To a picture show. Rob brought me home read in evening. Friday March 10th 1922 I did a little sewing today and wrote to Lydia. Rob took Hattie down to Fannies and the rest of us were there for supper. Home at ten oclock. Saturday March 11th 1922 It was such a bright day. I helped Cora clean up the house and did a lot in my part of the house. Rob took Hattie down to Fannies. I was down late in afternoon. Rob & Cora to town. Hattie and I to bed early. 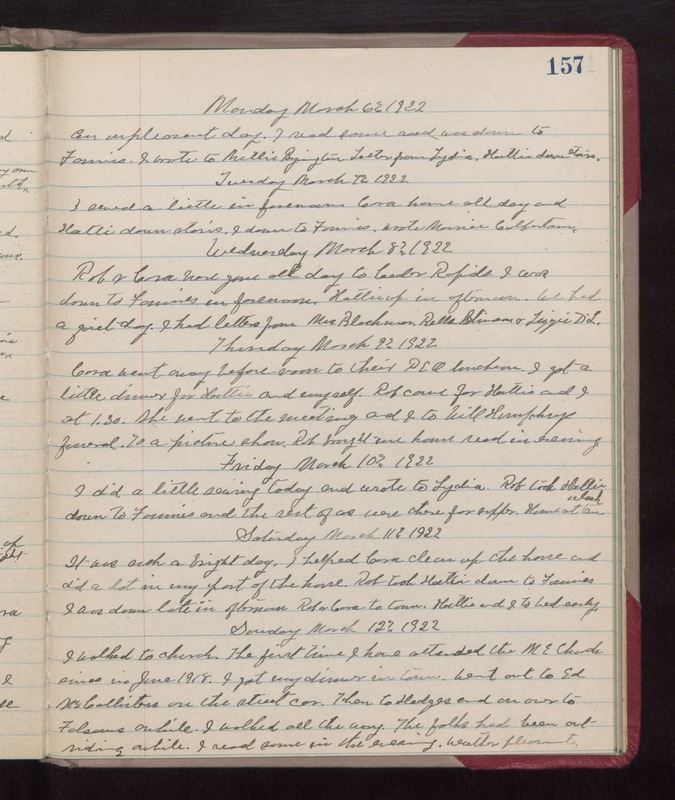 Sunday March 12th 1922 I walked to church. The first time I have attended the M E Church since in June 1918. I got my dinner in town. Went out to Ed McCollisters on the street car. They to Hedges and on over to Folsoms awhile. I walked all the way. The folks had been out riding awhile. I read some in the evening. weather pleasant.